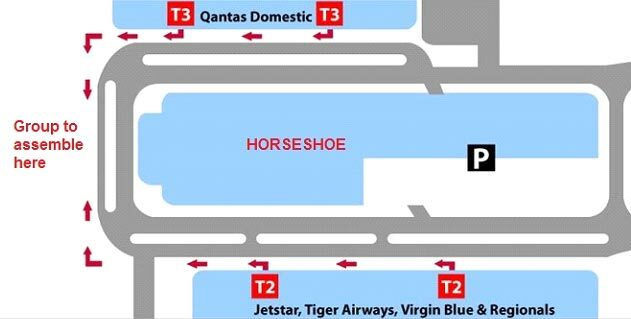 For all Airport pickups, we ask that once all passengers have cleared customs, have their baggage and are in the “public area” that they phone our office on 1800 287 242. We will then contact the allocated driver who will move into position for the pickup. (Please allow 15 minutes for the coach to move from the holding area to the terminal). Please ensure all passengers are ready and waiting to board the vehicle. The Meeting Pointfor international passengers is at the McDonald’s Restaurant which is situated at the end of the terminal. Passengers will require to turn right when exiting Gate A or B and walk to the end where they will find McDonalds Restaurant. The driver will come and collect the passengers from inside. For all Airport pickups, we ask that once the group has assembled and collected their baggage that they proceed to the coach bays immediately through the glass doors past Carousel 6. However, the parking outside carousel 6 is for 15 seats or more, anything less than 15 seats is required to follow the roadway outside of carousel 6 to the horseshoe shaped area behind the boom gate. The driver will be waiting here with their vehicle and a group name sign. If the passengers have any trouble locating the allocated driver, please call our 24 hour line (1800 287 242) and we will be able to contact the driver directly to confirm his location.